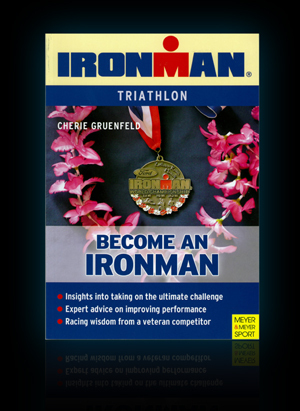 This amazing look into what it takes to become an Ironman is from author and TTS Coach Cherie Gruenfeld. As a ten-time age-group world champion, Cherie knows what she's talking about. As a TTS exclusive bonus, each copy of the book is signed by Cherie. This is an opportunity you don't want to pass up. Become an Ironman is a treasure trove of deeply insightful training and racing wisdom. Its purpose is to provide the reader with a rich collection of insider tips, techniques and expertise. Written in a straightforward, easily readable style, Become an Ironman is designed to deliver the most information in the fewest words possible. This guide is targeted at both shorter distance athletes and those who have already participated in an Ironman and want to improve their performance. Cherie Gruenfeld did her first Ironman at the age of 48 and went on to become one of the most decorated master's triathletes in the world. She has won her age group at the World Championships in Kona nine times and was the first woman over 55 to break the twelve-hour barrier. In 2000 she was honored by the World Triathlon Corporation as its "Female Age Grouper of the Year." Gruenfeld founded and is the director of Exceeding Expectations, a widely-respected non-profit foundation through which she uses her love of triathlon to re-direct the lives of at-risk kids in positive directions.